FIDE have announced their final list of Candidates for Kazan in 2011. All the players had to sign their contracts by December 22nd. As expected Magnus Carlsen isn't on the list following an announcement by him earlier in the year that he was unhappy with the cycle. 8. 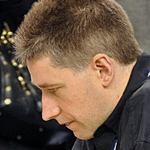 Gata Kamsky (USA, runner up of the Challengers Match 2009). Another great event lies ahead in the coming weeks as the famous Hastings tournament starts on 28th Dec. This historic event has attracted all the very best players in years past such as Alekhine, Botvinnik, Tal, Keres, Karpov, Korchnoi, Spassky and Larsen. One of the most famous Premier's took place in 1895 and won by the American Harry Nelson Pillsbury in great style. Even Garry Kasparov called it 'the most important tournament of the nineteenth century'. The Masters currently has 100 entries; the top 10 (by rating) being EDOUARD Romain, FRA, gm, 2636 ISTRATESCU Andrei, ROU, gm, 2616 HOWELL David, ENG, gm, 2611 KOTRONIAS Vasilios, GRE, gm, 2591 HEBDEN Mark, ENG, gm, 2560 SENGUPTA Deep, IND, gm, 2558 SETHURAMAN S.P., IND, im, 2547 NEVEROV Valeriy, UKR, gm, 2522 WILLIAMS Simon, ENG, gm, 2493 DAS Arghyadip, IND, im, 2476. The 2nd Classic was a great event. There was always a niggling thought that the chess could fall flat on its face but it didn't. McShane shook everything up with a win against Carlsen in round 1 and from that point the event took off. Malcolm Pein's management throughout was impeccable. So much positive stuff has been written that it's hard to add anything new so it's probably best to let others and the website do the talking. And let's look forward to the Classic 2011 or even a London World Championship in 2012. The videos at the Classic were produced again this year by Macauley Peterson (formerly of ICC). He is now is a freelance mediamaker. Magnus Carlsen clinched first place and the 50,000 euros first prize in the 2010 London Chess Classic at Olympia on Wednesday with a consummate positional win against England’s Nigel Short. Theirs was the second game to finish but the tie-break ensured that Magnus would take first regardless of other results. Vishy Anand and Vlad Kramnik drew their game and the two results should also see Magnus Carlsen Carlsen reclaim his place at the top of the official rating list in January 2011. 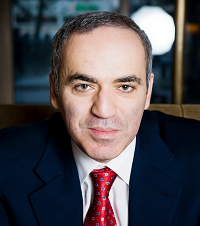 His mentor Garry Kasparov was present at the venue to comment on the games of the final round and see his protégé win the tournament for the second successive year. The London Chess Classic has been another resounding success on all fronts. It provides a fitting finale to the annual world chess circuit as the top players jockey for supremacy on the rating list. The technology brought to bear on the event is simply awesome: chess fans worldwide are able to see as much of the action and post-match commentary as the lucky people in the building, both in real-time and after the event. The players realise they are more under the spotlight than ever and respond with uncompromising play on the stage and some entertaining cut and thrust in the commentary room. The whole thing is a virtuous circle which showcases chess as the superlative leisure activity that we know it to be. The big winner here, as last year, was chess itself, so hats off to Malcolm Pein and his organising team for all their hard work. Garry Kasparov will attend the second London Chess Classic at the Olympia Conference Centre on December 15, the day of the seventh and last round. The former world champion has agreed to make an appearance in the commentary room, which should be a real treat for the spectators. Kasparov became the youngest ever undisputed World Chess Champion in 1985 at the age of 22. Never mind the cold weather, frost or even snow just consider what's ahead in the chess world during the next few weeks. The 2nd London Chess Classic will be staged from December 8th-15th at Olympia and promises to be another great event. It includes the current World Champion (Anand), his predecessor (Kramnik) and his possible successor (Carlsen), plus a bevy of high-class players. 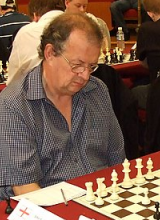 Grandmaster and chess journalist Larry Evans passed away on Monday, November 15th at Washoe Hospital in Reno, Nevada (USA). He died from complications following a gall bladder operation. Evans was born in Manhattan on March 22, 1932, and learned much about the game by playing for ten cents an hour on 42nd Street in New York City, quickly becoming a rising star. The 2010/11 4NCL season is underway and our new team the 'Spirit of Atticus' got off to a flyer with two wins. John Carleton's meticulous preparation and Dave Robertson's cuisine research were certainly key to our early success. 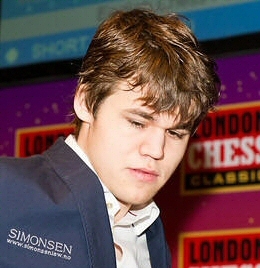 The world's number one player Magnus Carlsen has decided to drop out of the current World Championship cycle, in which he had reached the Candidate stage of the last eight. The series of knock-out matches is scheduled to begin in March next year, to determine the challenger to World Champion Vishy Anand. Letter to FIDE. TWIC - The 9th Chess encounters Nationales and Internationales of Cap d'Agde (FRA) took place 22nd - 31st October 2010. The organisers got the final they would have wanted between the top seeds Vasily Ivanchuk (2754) UKR and Hikaru Nakamura (2733) USA. Chessbase - It was the usual story: Magnus Carlsen kept putting intense pressure on the opponent, turning the screws, until suddenly he cracked. Unusual was that it was the former world number one, Veselin Topalov who buckled (with a terrible blunder 32.Rc3??). The other Rd9 games were drawn. Following the final round (10), Carlsen finished 1 point ahead of Anand (2nd) and 2 points ahead of Bacrot (3rd) and won the event with 7/10. The Nanjing tournament took place Oct 19th - 30th in China.  Chessvibes - Today’s round was the shortest so far, with all games ending in draws before the first time control and one game even lasting just 14 moves. Bacrot was apparently happy to draw with the white pieces against Gashimov, who couldn’t do much about in an Exchange Slav. The only thing to write about is that Bacrot had exactly the same draw with Gustafsson in January this year, but even that is a just a minor detail. Peter Doggers of ChessVibes and Macauley Peterson (now an independent producer) have produced the official videos from Nanjing. We are pleased to announce that a 'Spirit of Atticus' team will compete in the new 4NCL Northern League this season. Captain John Carleton has made all the necessary arrangements and the first two rounds take place on Saturday & Sunday 6th & 7th November at Barcelo Redworth Hall near Darlington. The new 4NCL website is now LIVE. Peter Sowray's huge contribution to the league is a hard act to follow but working with a professional and smart management team will make the task that much easier and fills me with endless optimism. Click to see Division 1, Division 2, Division 3 & Northern League fixtures for 2010/11. Following a spat between the congress organiser and the ECF FIDE rating officer events scheduled for 2011 have been cancelled (at least in their current form). The dispute appears to have arisen over the requirement of the organiser Sean Hewitt to provide rating reports for the separate FIDE sections (Open & Major) from previous events. Instead, it seems combined reports were submitted requiring an additional payment of £6.00, which was refused. The unresolved matter has resulted in what amounts to an ultimatum being issued by Hewitt for the resignation of the rating officer. • Read the carefully worded e2e4 homepage about 'planned' events. • See ECForum threads 1 & 2 where the argument continues. The 4NCL held its first team and individual rapidplay championships on 9-10 October 2010 for which entries were invited from all interested teams and players. It was a great success, immensely competitive and extremely well organised. Winners of the team event were Barbican 1 and winner of the Individual title IM Tom Rendle. They now hold the title of 4NCL Team and Individual Rapidplay Champions respectively for 2010/2011. • Click for full details, crosstables and photos. Ukraine won the gold medals at the Olympiad in Khanty-Mansiysk after four draws with Israel in the last round. Russia took silver after a 2-2 against Israel, who edged out Hungary on tiebreak to win bronze. The 39th Chess Olympiad took place September 20th – October 3rd at the Tennis Sport Development Center in Khanty-Mansiysk, Russia. 148 teams (735 players) in the Open section and 114 teams (559 players) in the Women section participated in the biannual event. Each team consisted of four players and one reserve. The rate of play was 90 minutes for 40 moves and then 30 minutes to finish the game, with 30 seconds increment from move one. Liverpool and Aigburth Chess Club player Joe Siddall has been jailed by Liverpool Magistrates following his conviction for theft. He was branded 'evil and wicked' by his victim’s family who spoke out after he was found guilty of stealing £22,400. Siddall ransacked the 79-year-old widow’s accounts after being left in charge of her finances. Chessbase - The news of the round, aside from the team results, was Carlsen’s second loss in the tournament, this time against English GM Michael Adams. In his loss against Georgian GM Jobava, his opponent had surprised him with an extremely offbeat opening choice. In the sixth round, it was he who chose an extremely odd line as of move two! The 2010 Chess Olympiad takes place from September 21st to October 3rd in Khanty-Mansiysk, Russia. It is an 11-round Swiss System team event, in which each team has four players with one reserve. Time control: 90 minutes/40 moves + 30 minutes + 30 seconds/move as of move one. Games start: rounds 1-10 at 9 AM UTC (5:00am New York / 2:00am Pacific daylight), and round 11 at 5:00am UTC (1 AM New York / 10 PM Pacific daylight). September 26th (after round 5) and October 2nd (after round 10). Representing England: (Men's): GM Michael Adams 2728, Nigel Short 2690, GM Luke McShane 2657, GM David Howell 2616, GM Gawain Jones 2576. (Women's): IM Jovanka Houska 2426, WIM Ingrid Lauterbach 2169, WFM Meri Grigoryan 2099, Kanwal Bhatia 2072, WFM Sarah Hegarty 2084. We are pleased to announce that a 'Spirit of Atticus' team has been entered for the new Northern 4NCL which has been advertised on this website over the previous few months. directly. 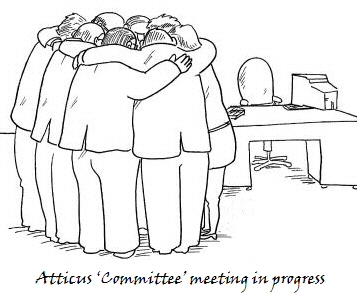 The Spirit of Atticus team is open to any interested party wishing to be available for selection. The weekends to be used are the same as for the 4NCL itself, and detail may be found on the 4NCL site or see Mike Truran's contact below. This year's Championships have only recently finished but already the new website for 2011 is up and running. Ponds Forge, an International Sports Centre in Sheffield, will play host to what promises to be one of the strongest British Championships for many years. ECF President CJ de Mooi has already announced that Short, Adams, Howell and McShane will take part with further announcements to follow. Details of accommodation and events to enter will be posted on the official site in the near future. Alien believer and FIDE incumbent Kirsan Ilyumzhinov has been re-elected for a further four years. The vote took two hours; the final count was 95 to Ilyumzhinov and 55 to Karpov with three abstentions. See also 'Echoes of the Election' on Chessbase. 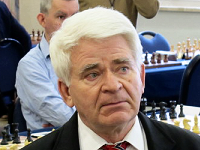 Russian media report that Boris Spassky is conscious, and his condition is stable. More than a week ago the 10th World Champion suffered from a stroke and was taken to hospital. The Russian news agency RIA Novosti reports that he is in the ICU Burdenko Institute of Neurosurgery in Moscow in a stable condition. Apparently Spassky can move and eat on his own again. It has been reported that former World Champion Boris Spassky is in intensive care after suffering a stroke in his Moscow apartment. Doctors said that after receiving an emergency call they discovered the 73-year-old in a semi-conscious state, paralyzed on his left side. They said his condition was grave. Born in 1937, he became the tenth World Chess Champion, winning the title with a 12½-10½ victory over Petrosian in 1969, and losing it to Fischer in 1972, in what was probably the most famous chess match in history. 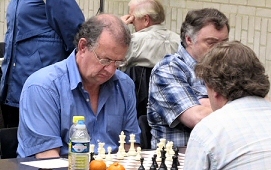 The 4NCL will be holding its first team and individual rapidplay championships on 9-10 October 2010 for which entries are invited from all interested teams and players. Winners will hold the title of 4NCL Team and Individual Rapidplay Champion respectively for 2010/2011. We are guaranteeing a prize fund of at least £2,000 for the weekend. Click for full details of this event. - Mike Truran. Thousands of years old, transcending geographical boundaries and cultures, the game of chess is still evolving and new technologies are aiding that progression. Simon Terrington has made a documentary called Seeking the Endgame for BBC World Service about the technical and cultural changes in the game. "I have been a keen chess player since I was very young. My dad taught me to play chess. "Back then you would go to your local chess club and there were three people available to play". [Read full article]. Listen to Simon Terrington's 5 live documentary Seeking The Endgame. This will be held over the August Bank Holiday Weekend, Saturday 28th - 30th August 2010. Venue: Wellfield Business and Enterprise College, Yewlands Drive, PR25 2TP. It's a 6 round Swiss congress, two rounds each on Saturday, Sunday and Bank Holiday Monday. The congress is an ECF Game Fee event and there are three sections, FIDE Open, Major (Under 170), and Minor (Under 135). The Open is also a British Championship 2011 qualifier. • Click for further information and PGN Games. Researchers at Washington University in St. Louis claim that Soviet players colluded in world chess championships held from 1940 to 1964. They argue that players agreed draws amongst themselves to improve their chances. The most famous instance, the 1962 Candidates' Tournament, concerned the allegations of collusion. The three top finishers, Petrosian, Geller and Keres drew all twelve of their games against each other, in an average of only 19 moves. 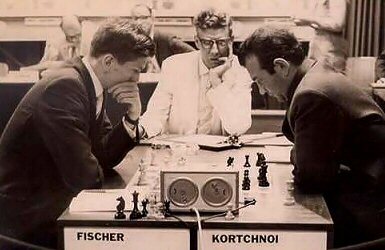 Soon after the tournament, Fischer publicly alleged that the Soviets had colluded to prevent him from winning. His main allegation was that Petrosian, Geller and Keres had pre-arranged to draw all their games. Could such collusion, between players, teams or even clubs happen in amateur chess? Of course it can. Last year in the MCA league, match re-arrangements in Division 1 during the second half of the season led to accusations of collusion. A delay of over four months occurred before two clubs got round to playing their crucial 'decider'. And John Carleton's article 'Fair Competition' eloquently details the extent to which officials will go to, to win at all costs i.e. to prevent another club from winning the league competition fairly. A disturbing feature is that the apparent collusion took place under the very noses of the league officials. This is bad enough but worse, the officials have failed to take any action or condemn the behaviour and another club has gone to the extent of publicly congratulating the 'winners'. This bizarre twist should be an alarm call to any self-respecting player because it begs the question - where does the collusion end - two clubs, three clubs? The University of Kent, the UK’s European University with 17,000 students hosted this year's Championships 25 July - 7 August. Click for further information, results, photos and prizewinners. Congratulations to Mickey Adams who won the 2010 British Championship (and is therefore also English champion) with a score of 9½/11 and a 2757 performance. Nick Pert finished second on 8 with a 2612 performance whilst Stuart Conquest, Andrew Greet, Jonathan Hawkins, Adam Hunt, Richard Pert & Alexei Slavin all finished equal third on 7½. Congratulations to Adam Hunt who secured his 2nd GM norm with a 2624 performance over eleven rounds. Well done to John Carleton, winner of the Atkins (open section) weekender at the British Championships in Canterbury with 4½/5. Travelling down on the Friday, he had little time to prepare. And with the unusual layout of the University campus and few reference points to guide the newcomer, John did well to avoid losing time on his clock when games started at 7:00pm. 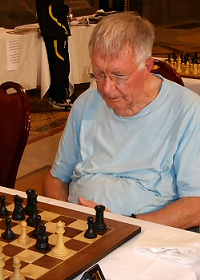 In Sunday's final round John's superior opening knowledge and positional skills (plus 45 odd years of experience) left his young opponent with little choice but to resign. John's prize(s) £140 and an early train home. Details including crosstable. More about the Championships. My reflections on the recent EGM of the Club are obviously going to be a great deal shorter than those of Club members who managed to sit through the meeting to the end. But here we go. I raised an important question at the start of the meeting regarding how the proposed Constitution had come to be be moved at this time. I had raised the same question with the Secretary in an e-mail when members were sent a copy of the proposed Constitution. I also asked for the identity of those moving the Constitution to be revealed, and also for a quick explanation of the rationale behind each section of the document. It seemed to me most important that members should have a chance to reflect on what was being proposed before the meeting. In fact we had been provided with a copy of the draft only after a request from Dave Hurley. I received no reply whatsoever to my requests. Thus when Dave James revealed that the draft Constitution was in response to the behaviour of Dave Robertson, Steve Connor and myself, it became finally clear to me that the business afoot was a continuation of the dispute already provoked, not by the three of us, but rather by Dave James and his cronies. So it was entirely appropriate that I stressed pertinent information relating to that dispute, including new information that had come to light as a result of the AGM. When Dave James made the explicit criticism of us, it meant that the discussion of the Constitution was doomed to be tarnished until the earlier dispute was resolved. I should stress that it was at the insistence of Dave James that the meeting, rather bizarrely, interrupted the unfinished business of the dispute (and its related dummy motion concerning the election of webmaster) to discuss the proposed Constitution. It was also his accusation/explanation for the constitution coming up now that meant the dispute and its ramifications had to be dealt with first. Thus the repeated interruptions from the chair were inappropriate, as were many of those from the floor. About the small contribution I was able to make, I would make the following points. The Secretary was correct to say that the evidence I produced regarding doctoring of proposed minutes looked very bad. He was correct to offer his resignation. This resignation should be accepted. His explanation that the situation arose through gross incompetence rather than design does not hold water in respect of the evidence produced, and indeed the further evidence I will publish if it is felt necessary. It is also inconceivable that the Secretary acted without input from at least the Chair of their committee since at no point did the Secretary take a leadership role in (their provoking of) the dispute. Thus, being prevented from doing first things first, I felt obliged to exempt myself from the remainder of the meeting. I should say that if a constitution is regarded as useful, then Tom Bimpson's proposals do seem eminently reasonable and reflect a fair and appropriate way that club members can interact. This is in stark contrast to the original proposals. It does not require a psychologist to work out that these proposals were a continuation of the bellicose intentions of those involved in its production. As luck would have it, we had a psychologist to hand anyway: Andrej's demolition of the "expulsion clause" did help to restore some sanity to the situation. Thereafter the club should be appreciative of Tom's efforts to introduce a calm and sensible working document. One of my regrets at leaving early was that I did not have the opportunity to hear Dave James propose item 17, regarding disputes. "In the event of a dispute with a team from another club this will be taken up by the Captain with the Captain of the opposing team. In the event that this does not resolve the dispute it shall be pursued by the Secretary under advisement of the relevant Captain and the Committee." how Dave James's briefing of Club members against me - while not informing me of what he was doing - squares with this eminently reasonable section of the new Constitution. The proposal of the original section 17 regarding threatening or abusive behaviour would also have been an interesting pitch. I'm sure that Dave James's crystal clear view that everything is Dave Robertson's fault would have come across forcefully. I am still available to go through the truth with anyone who is still in doubt. With regards to the Constitution itself, may I just pose a few questions? Will the constitution stop a group within the committee calling a meeting, and taking action against an uninvited committee member; and indeed not inviting another elected committee member who is likely to oppose their view? Will the constitution prevent some committee members pretending to be a complete committee and then traducing some club members on a public forum? The answer to both of these questions must be "no". Both these events happened during last season. The fact that the answer is "no" is not the fault of the Constitution because a Constitution cannot be expected to cover matters of such basic common decency. Another situation that falls outside the sphere of the reasonable is that of Dave James's stirring up club members with misinformation behind my back, referred to above. Naturally no constitution can be expected to cover such flawed and warped behaviour. But how does the Club respond? Does it feel this is appropriate behaviour? Will the constitution stop part of the committee invoking made-up powers; e.g telling the Webmaster that everything he publishes has to be agreed by the committee? The answer here is "yes"; (this also happened last season). 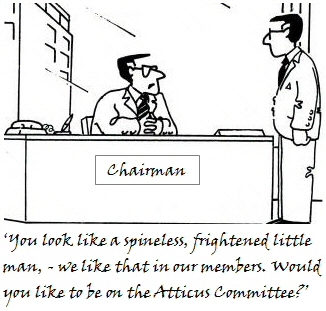 Under section 18 "In the event of complaints about the content of the Atticus Chess Club website this will be dealt with by the Webmaster under the advisement of the General Committee"; it is clear that the whole tenor of the Chair's communications with Steve Connor were grossly improper. My main regret at leaving the EGM early is that I was unable to express my personal gratitude for the unstinting work in the service of Chess and Atticus of two of our members. First, I must honour the Club's finest son, Dave Robertson. It is no slight on Steve Connor that I designate him thus. Dave Robertson's selfless and tireless work on behalf of Chess and our City over many years, but particularly during 2006-2008, have been well documented. The pushing of Atticus into the 21st century with the provision of the fabulous Adelphi venue and the complete restocking of our boards and sets, all at no cost to the Club, is undoubtedly one of the two main reasons why Atticus is currently such a magnet for chess players. 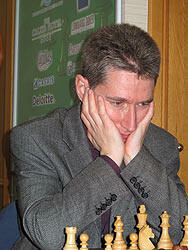 In most other clubs Steve Connor would be the greatest servant of Chess in their history. He is currently webmaster for the British Championship site, the 4NCL site and the London Classic site. His professionalism and dynamism are respected by all sections of British Chess. The Atticus website under his care has undoubtedly been the other most significant reason for the recent growth of the Club, and has been admired far and wide for the whole of Steve's tenure. I am ashamed to be a member of a Club that treats its greatest servants so badly, but proud to regard Dave and Steve as my friends. You may question my judgement. For it is true that I thought Dave James was a friend for well over 30 years. Reality has taken over only as I felt his stiletto between my shoulder blades. However in the case of Steve and Dave you need not concern yourself with my judgement; their record of unambiguous, straightforward exposition of the beauty and occasional deceit within our great game is the only testament they require together with the legacy of their many achievements within Chess. Following an EGM last nght, the club has split and been destroyed by a clique of spineless individuals calling themselves a committee. Concerns for the welfare of remaining members should be of interest to all chess players. For the record, I remain in full support of John Carleton, David Robertson and others who have taken a principled and courageous position regarding the dispute with Widnes over the last 18 months or so. They are outstanding examples of kind, hard working, honourable people the like of which we rarely meet in our lives. For 38 years they have given unstinting support to Atticus Chess Club. The unforgivable and unprecedented public attack on them and other long-serving members published on the MCA website was a disgrace. The ‘Dossier’, produced by the 'committee', a further act of lies and malice, should be treated with contempt as should the individuals who attach their names to it; individuals morally bankrupt, prepared to betray their colleagues at the drop of a hat and possessing a breath-taking level of vindictiveness. 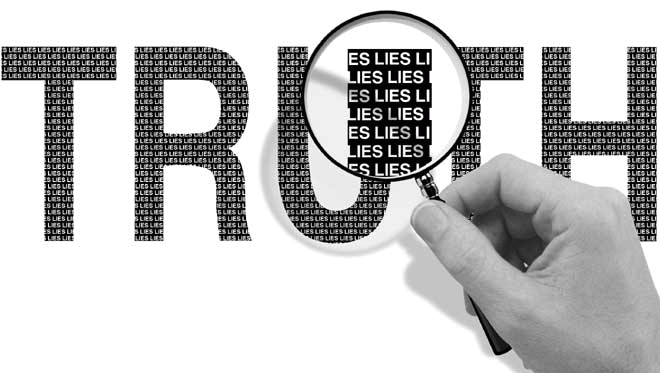 They know who they are and when the truth unfolds, others will too. My contribution as webmaster has been to support and promote chess for the benefit of the Club and community. I have acted honourably and recognition for such has been forthcoming. Only this ‘committee’ with their propaganda and paranoia could see it differently. 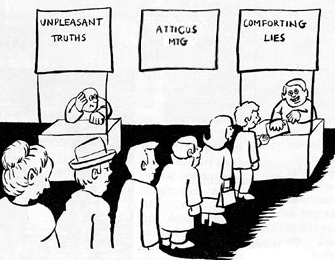 But they ignore the truth because it’s no longer convenient. Members not so easily hoodwinked will no doubt have their own worries and so they should because this ‘committee’ will now take the Club down some very dark and dreary pathways in the years ahead. The final rounds (9, 10 & 11) of this year's 4NCL in Divisions 1-2 took place at the De Vere Venues, Sunningdale Park, Berkshire on Sat 1st - Mon 3rd May. This is one of the best venues used by the 4NCL situated in beautiful Berkshire countryside. See more photos. Division 1 was won by WG Hilsmark Kingfisher 1 with Jon Ludvig Hammer and Luke McShane on top boards. Runners-up were Pride and Prejudice with Mickey Adams and David Howell on their top boards. Click for the Division 1 demotion pool table. How will the levelling of the score change the psychology of Anand and Topalov? Anand has white. So far both players have been happy to repeat the Catalan but today there has been a switch to the Nimzo-Indian. Anand clearly got his preparation in and Topalov has fallen behind on the clock. Later Topalov gave up two rooks for Anand's queen and now seems in for a very long afternoon if he wants to save the position. Latest: The game ended in a draw after Anand missed at least one clear win. The game was a heroic fight that lasted 83 moves, when Topalov once again claimed a threefold repetition. [Replay game 9]. After surviving playing black twice in a row Veselin Topalov gets the opportunity to go on the offensive in game 8. Topalov and Anand yet again play the Slav Variation Anand used successfully in games 3 and 5. Anand was the first to deviate with 13...Rc8. Topalov was the first in with a novelty, 18.a5. Anand didn't seem to play the best and got a miserable looking position, almost lost if not losing. However Topalov played oddly since then and allowed Anand into a bishops of opposite colour endgame. Anand got a completely drawn position and then played 60...Bc6??? which lost almost instantly and he resigned a couple of moves later. In contrast to game 7 both players played poorly. Anand's opening was bad, Topalov's exploiting of the advantage was less than accurate, and then Anand shockingly knew the draw but played something else. [Replay game 8]. Viswanathan Anand played white again today. Anand repeated the Catalan but Topalov followed up with an exchange sacrifice which was played by Ivanchuk against Gelfand in the Amber tournament earlier this year. Topalov seemed to have got a strong novelty in first for the first time in the match. He continued to play quickly until move 21. Topalov kept the pressure up even though he only had a piece for a pawn. Eventually he decided to repeat the position. Anand saw the opportunity to to play on and set Topalov some more problems. However with some accurate moves Topalov had just enough resources to hold the position and after trying a number of approaches the game was eventually agreed by repetition. [Replay game 7]. 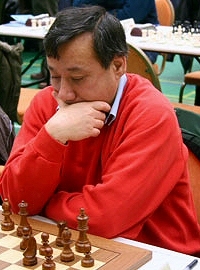 Anatoly Karpov was in Sofia to make the first move. The death of former FIDE President Florencio Campomanes was marked by a minutes silence at the start of the game. Game annotations and full details on TWIC. Could Anand take advantage of the white pieces in Game 6 to extend his lead to two points? Well the answer turned out to be no, in fact Topalov was quite impressive in holding the draw in spite of facing yet more preparation from Anand. Game 6 sees the first of two games in a row where Anand has the white pieces. White has dominated proceedings so far so this is a key couple of games. The regulation whereby Anand has white twice is in my view wrong-headed. It is a cure that is worse than the disease. The idea is to switch the player who has the white pieces immediately after the rest day around (there are two days play followed by a rest day). A much better solution would be to eliminate the extra rest day before Game 12 and go Game 6 then Rest Day, Game 7 then Rest Day which would achieve the same thing but not use this rather false construct. [Replay game 6]. Drawn by repetition in 44 moves. They followed the Game 3 Slav where Anand escaped with a draw. Anand's first 5 minute think was over move 14 and he decided to play 14...Rg8 again. After 15.h4 Anand was the first to deviate with 15...h5. They had a complete power failure in the the centre of Sofia for a few minutes. The game resumed after about 12-14 minutes. Both players agreed that with 22...f6! black had equalised. After the draw in game 3 it was Anand who was looking to make progress with white in game 4. Anand opened with the Catalan as Kramnik did in his match against Topalov in Elista. Anand played a novelty with 10.Na3 which led to a long think from Topalov. It may be Topalov had studied the position but not for a while. But in the end he played 10...Bd7. So the big question was if Anand's preparation could cause serious problems for Topalov. Now it is up to Topalov to strike back with white on Friday. This has been a match where the white pieces have dominated (three wins and a draw so far) but Topalov will have some recovering to do after this loss. More news and match details are available on TWIC. 27th April, Game 3: Another fascinating game today as both players fought to retain control in a queenless middlegame. The opening, a Queens Gambit Declined, Weisbaden variation, was a repeat of Topalov’s 6th game against Kramnik in the 2006 World Championship until he deviated with 14.Rc1 instead of the more usual 14.Ke2. Topalov did enjoy a small space advantage but Anand’s careful and patience response was sufficient to stop enough progress being made to force matters. Topalov’s body language is revealing as he leans much further over the board than his opponent, at times looking somewhat frustrated and intense. Anand in contrast looked calm and controlled as he nullified any winning chances by his Bulgarian opponent. The game petered out into a level rook and pawn and following a repeat of the position and after permission from the arbiter was granted, the game was agreed drawn. The players did not shake hands at the end. 25th April, Game 2: Anand strikes back. A quieter game today saw both players happy to achieve equality from the opening. Anand's novelty 15. Qa3 did not appear to be an improvement but Topalov was passive after the position clarified and 25...Ne3?! was a turning point. A series of accurate rook moves gave Anand a clear edge and after 30.Rc7 many commentators had him winning. 24th April, Game 1: Perhaps still suffering from pre-match travel chaos, Anand, with a seriously under-developed position, folded in a Grunfeld defence in just 30 moves. Anand's confidence has taken a jolt particularly as Topalov played his moves very quickly, and with great precision. But Anand has the White pieces in game 2 and will come out fighting as always. Before this match, Anand and Topalov have met 87 times. Anand scored 55%: he won 23, drew 50 and lost 14. However, this includes rapid, blitz and blindfold games. In classical games, in a total of 44, Topalov won 11, Anand 10 and 23 were drawn. In a letter published at the Karpov 2010 campaign website, Anatoly Karpov has responded to Arkady Dvorkovich’s remarkable move to already announce the Russian Chess Federation’s nomination of Kirsan Ilyumzhinov. “I must state that the world chess community has been cheated in the most blatant manner,” says the former World Champion. Recently Chessvibes reported the announcement by Arkady Dvorkovich, the Chairman of the Supervisory Board of the Russian Chess Federation (RCF) and Advisor to the President of Russia, that the RCF has nominated Kirsan Ilyumzhinov as FIDE President candidate. Read Karpov's response published on his campaign website. "The decision to delay the match by one day to me is illegal and disrespectful to the Organising Committee – said Silvio Danailov, manager of Veselin Topalov. Lawyers have already investigated the matter, and we reserve the right to file a case against the International Federation (FIDE) for lost profits." Such was the unwanted gift Danailov received on his birthday yesterday, he was strongly opposed to the postponement due to late arrival of the world champion Viswanathan Anand. The Organizing Committee of the match took the same view, but the game supervisor George Makropulos decided otherwise. The games are to be played on two consecutive days, with a rest day to follow, and a one-day shift of the entire match schedule. Does Karpov stand any chance? A few weeks ago Chessbase published a statement by the Turkish Chess Federation supporting the candidacy of the President of FIDE Kirsan Ilyumzhinov, who is seeking re-election for the term 2010-2014. Four FIDE Continental Presidents have joined the TCF in declaring support for the incumbent. Public statements. However, the United States Chess Federation and German Chess Federation have given their support to Anatoly Karpov. The gloves are off and the campaigns have started but does Karpov really stand any chance? Chessvibes analyse the letters in 'FIDE elections: meaningful and meaningless support'. Karpov has released his campaign mission outlining the main goals and themes and is available in Russian, English and Spanish. Click to download an English version. Latest: Match start is delayed by one day. The first game will now take place on 24 April. After an arduous journey lasting over forty hours Anand arrived in Sofia on Tuesday morning. He travelled from Frankfurt to Sofia with his luggage and support team in a Mercedes Sprinter. Meanwhile FIDE Deputy President Georgios Makropoulos has successfully negotiated a short postponement to give Anand time to adjust. It was supposed to start on 23 April and due to finish on 10 May with six rest days, seven if tiebreaks are needed. Topalov will just have to wait, which has not gone down well with his manager Danailov. The time control in each game is 120 minutes for the first 40 moves, 60 minutes for the next 20 moves and then 15 minutes for the rest of the game with an increment of 30 seconds per move starting after move 61. Last week, and before all the volcanic ash chaos, Anand found time to fit in an interview with Aljazeera reporter Riz Khan in his One on One show, on 10th April. In it Anand describes his career in chess. Click to see the two-part interview. The long awaited match between Anand and Topalov is due to start on 23 April but a big cloud now hangs over the event, a cloud of volcanic ash that is. Anand is stranded in Frankfurt over 860 miles away with little prospect of escape. The match is scheduled to finish on 10 May with six rest days, seven if tiebreaks are needed. Postponements, not permitted in the original regulations, are now likely given the extraordinary events in Iceland ... more. Sun March 28, 2010 - More sad news is announced today as we discover that former World Champion Vasily Smyslov died on Saturday March 27 just three days after his 89th birthday. Smyslov was born on March 24, 1921, auditioned as a baritone singer at the Bolshoi Theatre before he took up chess as a full-time career. In 1957 he beat Botvinnik in the world championship match and held the title for a year. Chessbase have published a comprehensive report including several photos of historical interest. Sensational archive material has recently been released by the British Library, and, as with all documents relating to the noble game, a priority copy was promptly forwarded to the Club in recognition of the high esteem in which we are held throughout the academic world. Here is an extended extract from the most exciting document, one which casts new light on the origins of Atticus. Rounds 7&8 in Divisions 1-2 take place at the De Vere Venues, Staverton Park, Northamptonshire on Saturday 27th & Sunday 28th March. The matches start at 14:00 on the Saturday and 11:00 on the Sunday. Watch LIVE games from Div 1. Rounds 7&8 in Division 3 take place at the Barcelo Hotel, Daventry over the same weekend. Complete fixtures and pairings for each division can be seen here. Southport CC player Derek Geoffrey Horseman has died 18th March 2010 in hospital, after a short illness, aged 78 years. Dearest husband of Theresa; much loved father of Anne, Marie and Sarah; loving Grandad to John, Mary, Gerard, Patrick and Francesca. All enquiries to Gibb's Funeral Directors, Clarence Mews, 6a Clarence Road, Southport, PR8 4BH. Tel: 01704 551666. The chess community has lost a fine person, an excellent player and a brave man. Unfortunately at this time the simul has been cancelled because a vindictive clique within the Club known as the 'committee' have conspired to block this wonderful opportunity. Plans for any future simuls will never be shared with members. All matters to do with such things will be kept secret by this joyless and selfish mob. For those of you with long memories, the format we are using is not dissimilar to the now defunct British team lightning championships (held between 1953 and 1992), with the team championship held on the Saturday and the individual championship on the Sunday. Winners will hold the title of 4NCL Team and Individual Rapidplay Champion respectively for 2010/2011. We are guaranteeing a prize fund of at least £2,000 for the weekend. Hopefully both the format (significantly different from the previous 4NCL rapidplay events last held in 2008), the time control (10 minutes + 5 second increment per game) and the time of year (a month before the start of the new 4NCL season) will prove attractive. Although it would of course be unrealistic to expect entry fees to be paid in advance of the deadlines (30 September, or 30 June for discounted entry fees), I would very much appreciate it if you could let me know whether you expect to enter. That will help me give the venue an idea of likely numbers in advance. Click for full details of this event. Click to see photos and video from rounds 5&6 from Divisions 1-3 at the Barcelo Hotel, Hinckley Island, Leicestershire. Complicated tiebreak rules made all kinds of scenarios possible, but in the end it was clear. By beating Gelfand in a tense game, Topalov won outright as Grischuk drew with Vallejo Pons. This year the tournament involved six players, two short of the usual eight and took place February 12-25 in Andalucia, Spain. Veselin Topalov (2805), Levon Aronian (2781), Boris Gelfand (2761), Vugar Gashimov (2759), Alexander Grischuk (2736) and Francisco Vallejo Pons (2705) are playing. Rounds started at 16:00 CET (15:00 GMT); rest 17th & 22nd. Rate of play: 2 hrs/40 moves, 1 hr for 20, then 20 mins for the rest of the game, with 30 secs increment from move 61. The Sofia rules for offering a draw apply in Linares for the first time. Feb 10 2010: Following the screening of this famous DVD at FACT there followed a very engaging talk by David Robertson, Professor of Public Policy at JMU. David (left) was the principle organiser of Liverpool's hugely successful chess tournaments 2006-8. The very appreciative audience, some with very little chess knowledge others with long standing club experience, all enjoyed his thoughtful and incisive analysis. There are some additional pics from rounds 1&2, and some of the hotel itself, from this year's Gibraltar Masters here. Click to see some short videos of the Masters and Challengers. John Saunders reports: English grandmaster Mickey Adams has won the 8th Gibtelecom Masters after a four-player play-off. He did it the hard way, losing the first game of his semi-final against German GM Jan Gustafsson and having much the worst of the second game before Gustafsson blundered a piece. There followed an Armageddon game, with Adams obliged to win, which he did in some style. In the other semi-final Paco Vallejo Pons of Spain won his first game quite comfortably against Chand Sandipan of India. He was comfortable in the second game but Sandipan fought back to the point where he should have won, only the make a terrible blunder which cost him the win. The final saw Adams in his best form, soon securing a strong advantage which he carried through to victory. In the return, Vallejo Pons got a bad position but his attempt to mix the game up cost him a piece and he could only draw. The two-game mini-matches were played at a time control of 10 minutes with 10 second increments and the Armageddon game at 5 minutes to 4. The 8th Gibtelecom tournament took place at the very plush Caleta Hotel in Gibraltar. The Masters event started daily at 15:00 local time (14:00 UK) and had a remarkable line-up of talent including Gata Kamsky, Etienne Bacrot and Mickey Adams (the eventual winner). Full details and pairings for each round can be seen on the official site where you can see photos and video. More photos here. The top seed and leader of the A-Group, Magnus Carlsen, drew his final game, as did his main contenders, which left the 19-year-old Norwegian the sole winner of the tournament. His FIDE ranking in the next list will most likely be the second highest in history. Kramnik and Shirov share 2nd-3rd. In the B-Group Anish Giri was first, ahead of top seed Naiditsch. Live coverage from all sections was available on Playchess and ICC with daily reports on Chessbase by English FM and writer Steve Giddins. Video coverage was presented by ChessVibes and Europe Echecs. I’m happy to say I won the Corus 2010 A group in the end with 8.5/13 points, ahead of Kramnik and Shirov at 8 and Anand and Nakamura at 7.5. Having described my last round blunder and subsequent save against Short in London in December as a narrow escape, I could better have reserved the phrase for today. As white against 17-year old F.Caruana I settled for a closed Roy Lopez position out of the opening, but he defended precisely and the position was fairly equal. In the middle game I found a plan that I thought would leave me with a nice initiative, but had calculated horribly wrong and ended up in a very difficult position. Instead of suffering without counterplay, I sacrificed a pawn to activate my pieces. The knight endgame a pawn down was difficult, but we both thought it should be possible to hold with precise defence. In the fifth hour of play he allowed a line that drew fairly directly, while he could have made me suffer a while longer. In the meantime Kramnik had drawn with Karjakin and Anand with Van Wely, while Shriov against Dominguez was a sharp fight that turned out to be a real thriller. With very little time on the clock, Shirov found an incredible resource that turned a desperate-looking position into an unclear one. Dominguez made a blunder and offered a draw. Shirov didn’t see the winning line either and accepted with seconds left in a clearly winning position. After the traditional prize ceremony with pea soup there was a closing dinner for the players and organisers in the A-group hotel. The famous Dutch football star Edgar Davids is a chess enthusiast and he came to the hotel for a long chat which I really appreciated. Now I’m looking forward to a week of vacation abroad before returning to Norway. Divisions 1-3, rounds 3&4 took place Saturday and Sunday at Barcelo Hotel, Hinckley Island, Leicestershire (16th & 17th January). LIVE games were broadcast on Saturday (14:00) and Sunday (11:00). Click for all results and PGN games. The Masters ended in a fourway tie for first place, between Mark Hebden of England, British Champion David Howell, Andrei Istratescu of Roumania, and Romain Edouard of France. To nobody's great surprise, the two leaders, Hebden and Istratescu, halved out in 11 moves. This left them safely ensconced in the clubhouse on 7 points, from which they could observe the attempts of the various 6-pointers to catch them up. Gormally-Drozdovskij never looked like ending in anything other than a draw, but Romain Edouard defeated Simon Ansell with Black, to join the leaders. 1st= GM Andrei Stratescu, GM Romain Edouard, GM David Howell, GM Mark Hebden all scored 7/9. On-site reporter Steve Giddins has written an annotated 'daily commentary' and games from Rds 1-9 can be downloaded below. FIDE has just released the January 2010 rating list, and Magnus Carlsen at 2810 is the new World number one, five points ahead of Veselin Topalov, and twenty points above World Champion Viswanathan Anand. Magnus is the youngest player ever to reach 2800+ and to top the world rankings. Top 100 list. Other notable changes for British players: Nigel Short drops back below 2700 at 2696 and is now just two points ahead of Mickey Adams whose successful London Classic tournament means he retains a respectable 2694 rating. In the women's list not much has happened: Judit Polgar is almost 70 points ahead of Koneru Humpy and Chinese wonder talent Hou Yifan, a competitor at the Liverpool UK-China Summit match in 2007, continues to move slowly towards the 2600 mark. English IM's Harriet Hunt 2452 and Jovanka Houska 2401 feature in the World's top 100 women.